Linda Lum DeBono's book, Sew Merry and Bright, just won a prestigious book award from the Publishing Professionals Network. The book won an Award of Excellence for excellence in the areas of design, illustration, photography, paper, printing, and binding! Congratulations to all! 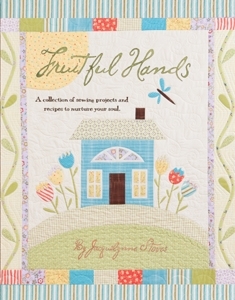 My new fabric line, Fruitful Hands, was inspired by my book of the same name. 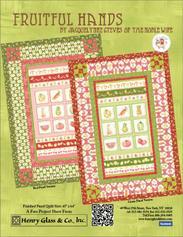 It features yummy fruity colors and fruit and vegetable motifs perfect for the kitchen and home. 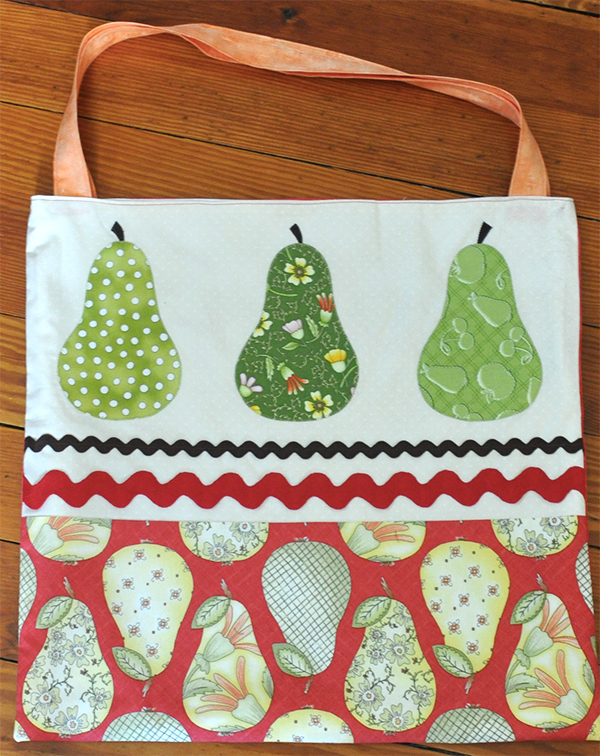 I also think the prints would be great for aprons, skirts, and tote bags. Of course, we have to make quilts with our fabric too, right? Here is a pattern called Grandma's Pantry. 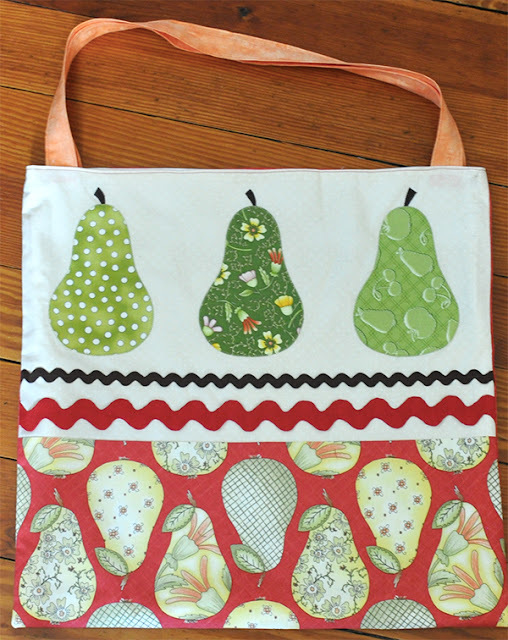 I love cherries and pears because they are so bright and cheery. I remember that my grandmother used to do a lot of canning in the summer and fall. Seeing these bright fruits reminds me of the colorful Mason jars lined up on the shelves of her basement pantry. That's how I got the name for the pattern, Grandma's Pantry. 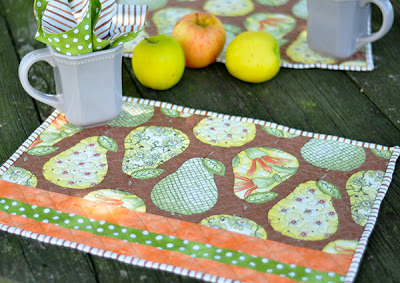 I hope you have as much fun playing with this fabric line as I am! Thanks for sharing, Jacquelynne! 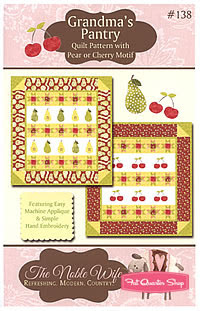 We've got a couple of fabulous free patterns for this line. Go and check them out on our website! 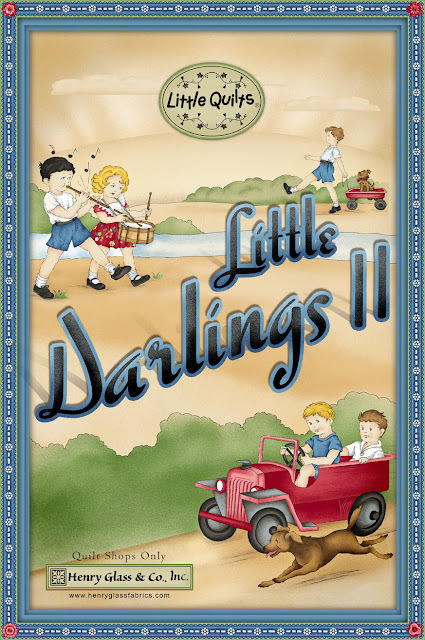 Little Darlings II - A Quick Peek! Little Quilts' newest design is Little Darlings II. It is a truly darling line. We asked Mary Ellen von Holt about the process of designing from their perspective. 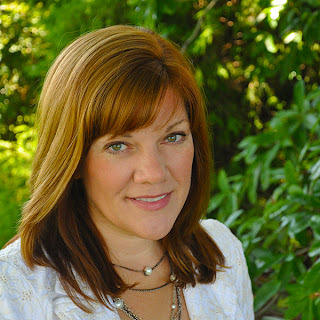 "We work with Lisa, our Design Director, and the artists at Henry Glass who help bring our concepts and designs together into beautiful groups. One picture is of a complete repeat of the main focus panel. The artists work with computers and this piece is an exact size and color of how the fabric will look when produced. At this time we review this artwork, color and make color and design corrections. It's a fun process! 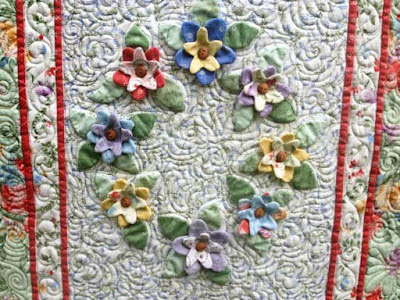 The coordinating fabrics all come out of this main panel." We can't wait to see the fabrics on the bolts. Meanwhile, go to our website to check out pictures of the entire line and the free pattern! 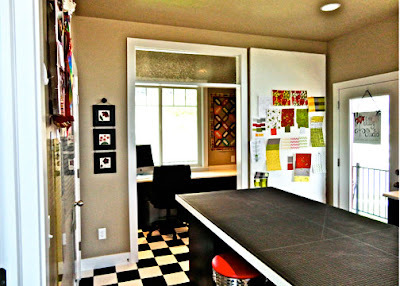 Are You Designing A Studio? Are you designing a new studio space or dreaming of doing so? 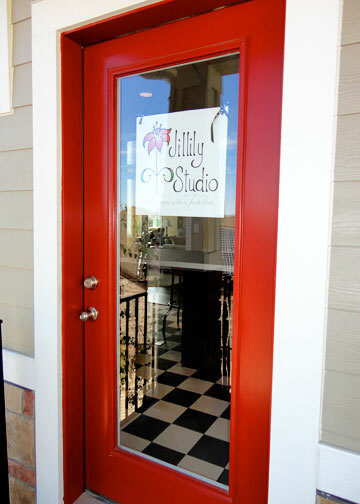 Jill Finley of Jillily Studio just designed a new space for her busy design business. We spoke to her about the process recently and here's what she had to share! HG: Where is your new studio? JF: My studio is in my home in Herriman, Utah. I have an outside entrance off the side porch and inside it is off of my family room. HG: How long did it take to build? Did you have a lot of input? JF: It took about 9 months from start to finish. 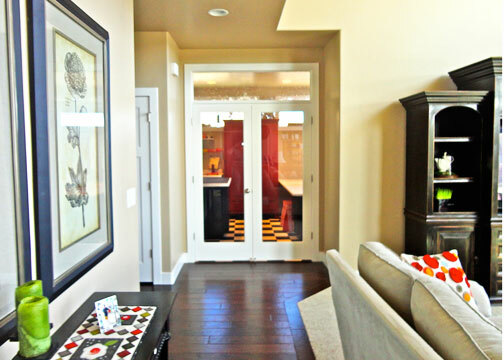 We used one of the builder's plans and modified it to add the studio and spaces our family needed. We worked with an architect to make all of the adjustments. HG: What did you want most in your new space? JF: Room! My last space was a 9' x 10' bedroom, which would be fine for a sewing room, but I am running a business and I needed a lot more room. My space needs to accommodate sewing, cutting, pressing, storage, shipping , filing, artwork, design, products, packaging, advertising, etc. I also really needed more surface area so I didn't have to clear off the cutting table just to ship an order! HG: What surprised you about your new space? JF: I am surprised about how much room I have. I had to stay within budget, so the studio size was limited. (Darn!) I was worried that I wouldn't have enough room. Most of the space is only 11' wide, but it is amazing how well it works when it is all designed specifically for my needs. My office area is only 5' wide, and it is perfect. (I wouldn't want to do more than 5' of office work, anyway!) For me, defining a specific space for the office area made a huge difference in the workability. HG: Do you have any tips for someone who is designing a studio? JF: Yes! First, I have some great photos on my blog here about the process that we went through. 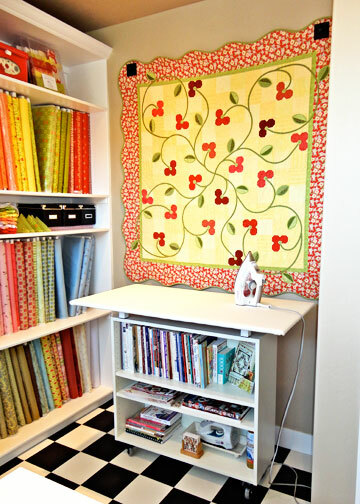 If you are setting up your sewing or crafting area, arrange it by processes, rather than things. 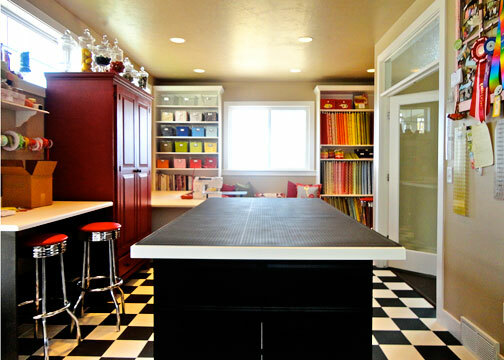 Think about each process or activity you do and arrange your space in stations or areas. 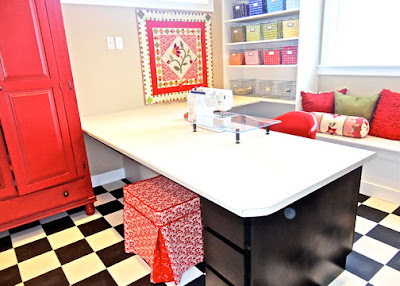 For example, cutting area, sewing station, pressing station, storage area, shipping area instead of sewing table, bookcase, ironing board, computer, etc. Your space will be more efficient and easier to work in. I knew that I wanted a black and white checkered floor because I have been using that in my booths for years. It's kind of my signature. Every other home we have lived in has had carpet in the sewing room. A history of finding pins and needles with bare feet made me insist on hard flooring. 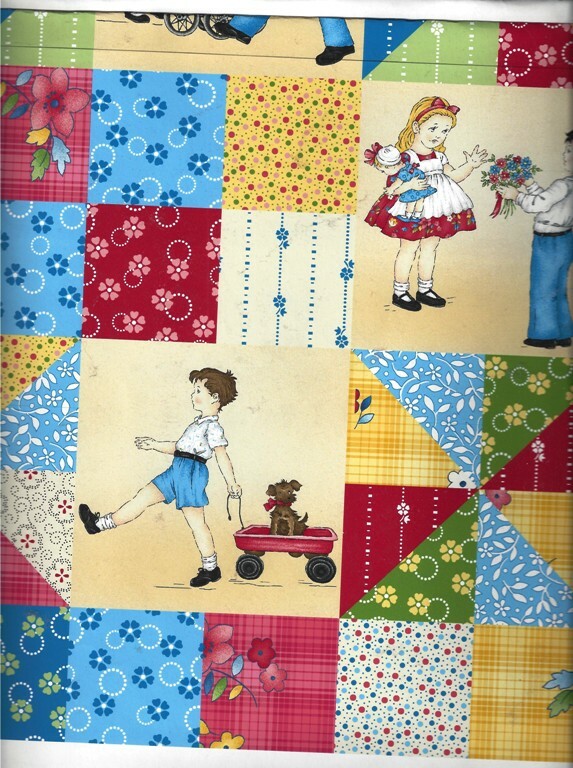 (All of the kids knew to never enter the sewing room without shoes on.) I thought I wanted tiles, but I found a wonderful commercial vinyl that gives me a nice smooth surface without any grout lines (for pins to hide in.) So far, I am very happy with it. I like a little of both. Closed for all the bulky, unsightly and non-creative stuff. Open for the creative inspiration kind of stuff ... like fabric, threads and books. 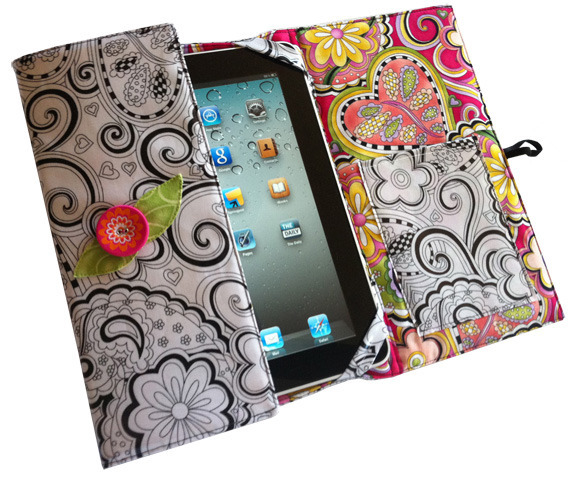 They are easy to access and look great. I have some open shelves in the office area (for budget reasons), so the things I store there are stored in bins to unify and organize the space. HG: Thank you for sharing your beautiful space! She's hosting an Open House on September 27th from noon until 6 p.m. Read more about her space here, here and here. Thank you to everyone who followed along our Summer Party! We hope that you enjoyed it! We sure did! We have some lucky winners to announce. Congratulations to all! Stay tuned for more fun events in the next few months! We're glad that you joined in on the fun! 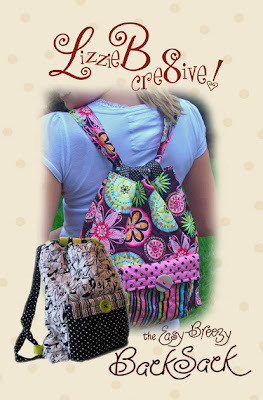 Lizzie B Cre8ive Loves Back To School! Liz and Beth Hawkins of Lizzie B Cre8ive have some very fun ideas for back to school. Yes, there is still time for those of you who are leaving things to the last minute or who have sent off the college kids and are now focusing on the kids at home. We love the iPad cover and just because the Olympics are over, it doesn't mean that we don't think about all things British. 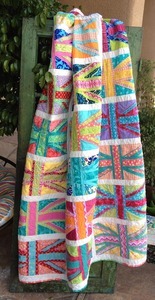 Love their I Heart London pattern. 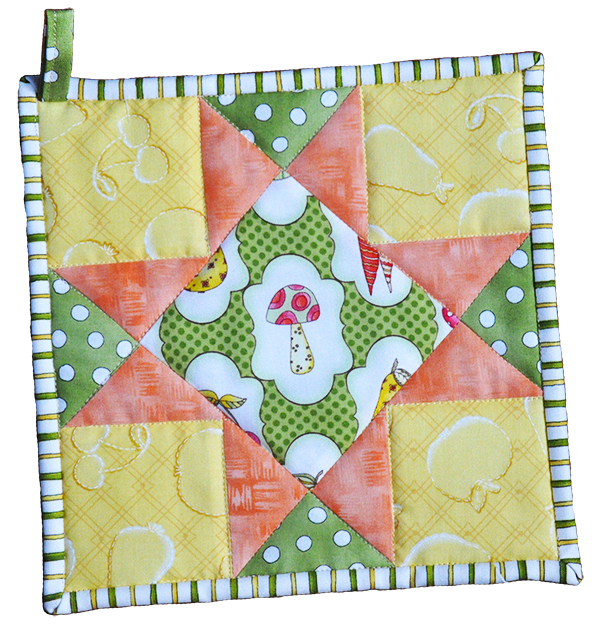 The Easy Breezy BackSack is so wonderfully easy. What a lovely back especially for those after the piano and violin lessons that are after school. You just have to prep the bag and have it ready to go by your front door. Bouquet Splendor And a Splendid Giveaway! Vicki Oehlke of WillowBerry Lane is the designer of the beautiful Bouquet Splendor range. 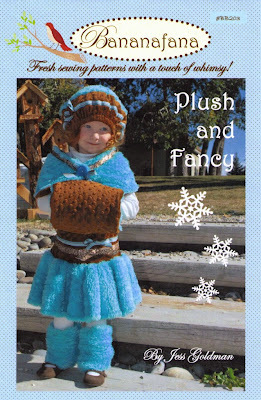 She recently sent us a sample to show off and we think that it is gorgeous! Here are a couple of detailed shots showing the dimensional flowers. 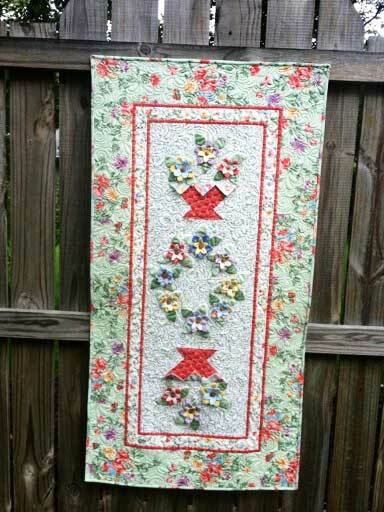 Vicki says that this design can be made up for use at the foot of a bed and it is easy to stretch it out if someone wanted the piece to be longer. 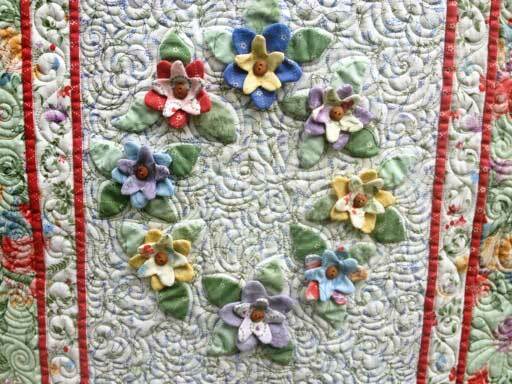 All you have to do is make more flowers for the center ring and make an oval of the flowers. 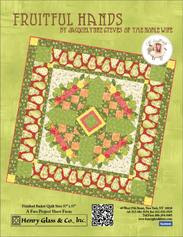 This pattern is available from Vicki's website at WillowBerry Lane. 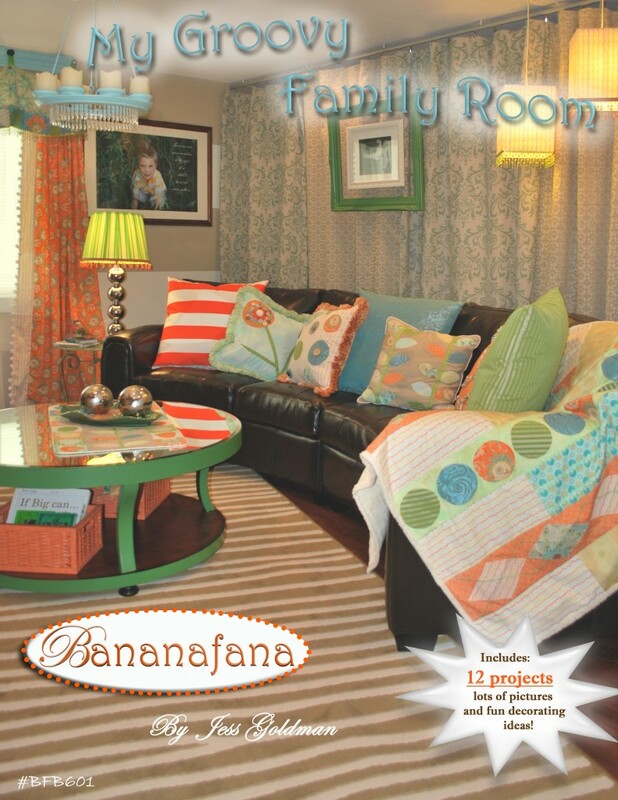 It's such a versatile design and looks great in many different color palettes. 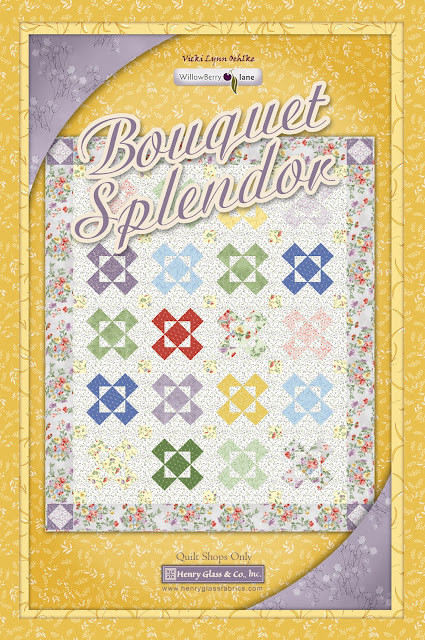 Bouquet Splendor is a very pretty line and you can find it at your local quilt shops now! Do check out the free pattern too on our free downloads page. 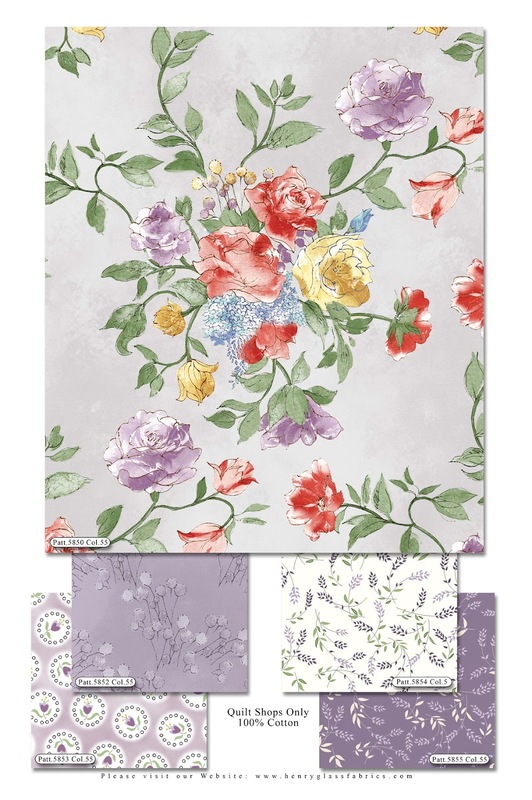 We have some Bouquet Splendor to give away! 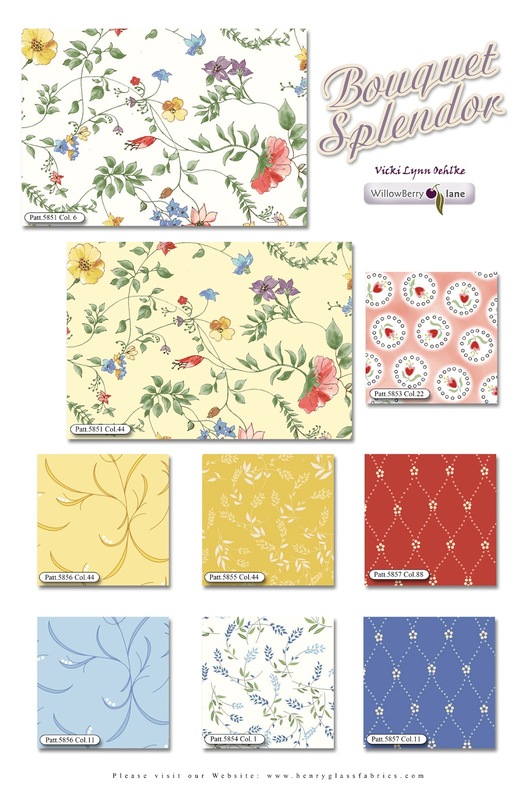 All you have to tell us is what your favorite flower is. Comment by next Friday, August 24th at 4 p.m. and we will randomly choose one lucky winner to win! p.s. We will be announcing the winners of our Summer Party giveaways next week! 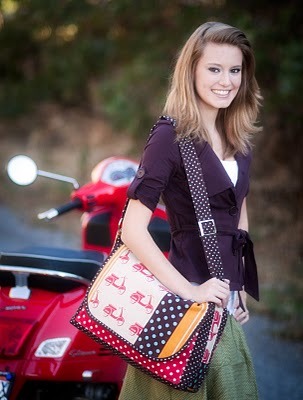 Jess Goldman of Bananafana Designs has a whimsical and colorful touch when she designs her patterns. It's all so happy and bright! Her girls [yes, those adorable models are her girls] are so cute in all of the clothes that they model. 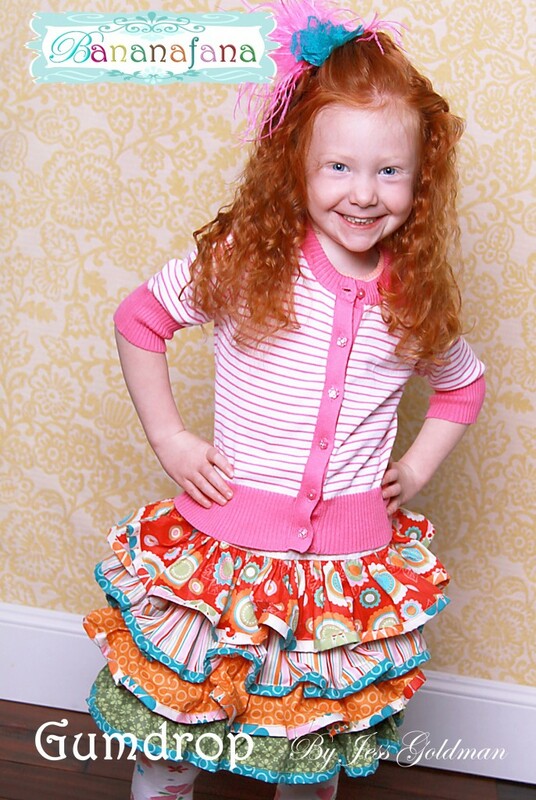 We love the ruffled Gumdrop skirt. Don't forget, Picture Day at school comes quickly! For those of you sending university students off to school, there's still a little bit of time to make these quick pillows. 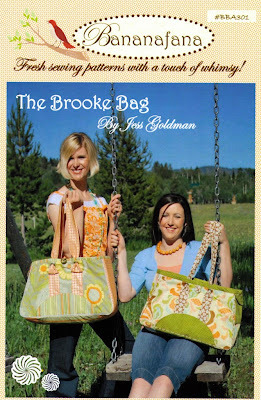 The Brooke Bag is wonderful and spacious. Don't forget the wee one left at home. Here's a project for you to consider when all of the back-to-school craziness has died down. So very fun! If you are thinking ahead, then there's the dreaded "w" word. Yes, winter. The Plush and Fancy leg and hand warmers look so cozy! 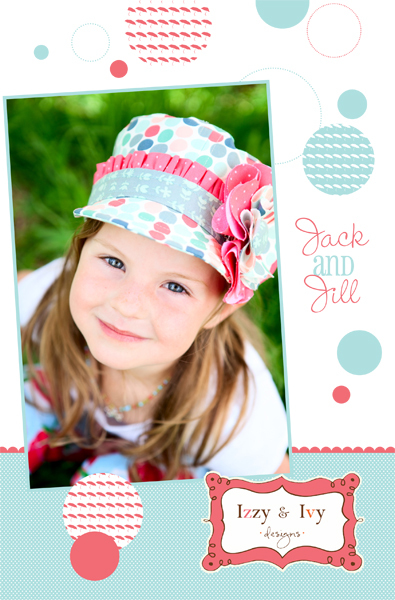 We have a winner for the Sew Merry and Bright book giveaway! 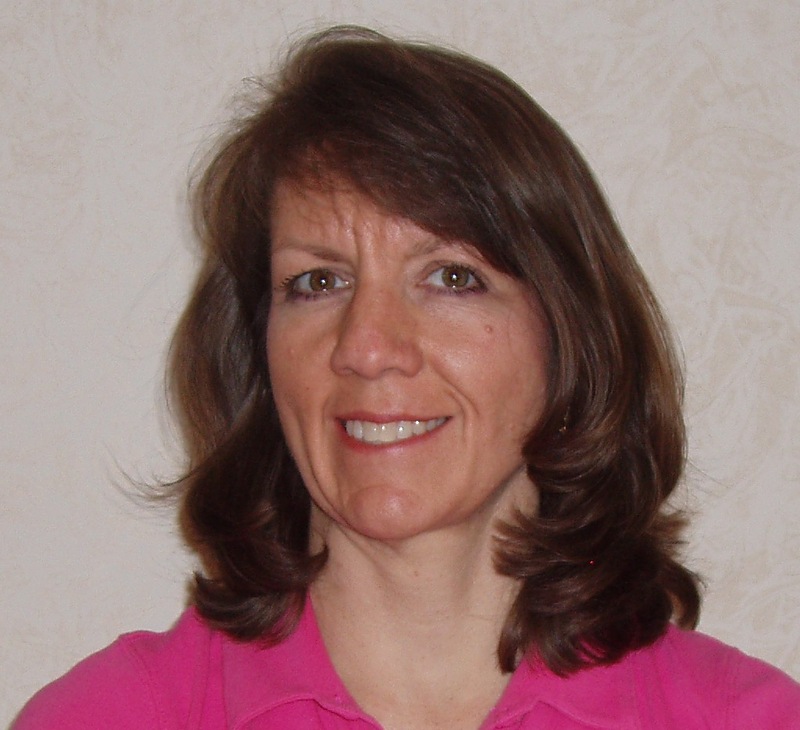 Thanks to Kim Diehl for the great review of Linda's new book! Congratulations to Linda on the new book! 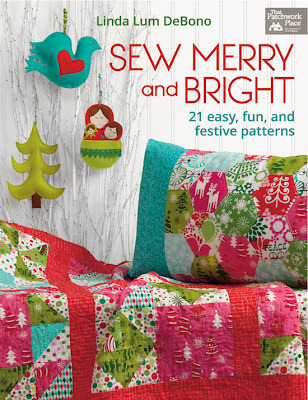 Congratulations to Colleen M. for her winning entry in the Sew Merry and Bright book tour giveaway! She likes the "Twelve Days of Christmas" by the Muppets. Please drop Kim Diehl a quick line at quiltwench [at] cableone [dot] net to provide your address and your signed book is on the way! Is it that time already? Yes, unfortunately. It's time to start thinking about the kids going back to school. For some of you that may be very soon! We want to showcase some of our designers' designs for children. We know that you'll find something fabulous! 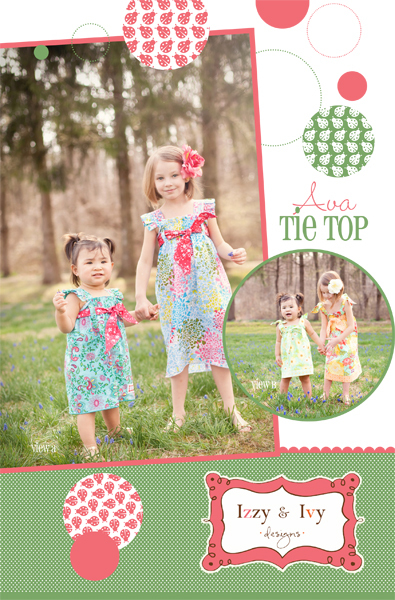 Let's start with Izzy & Ivy Designs. Yes, yes, yes and yes to the messenger bag, hat and dresses! 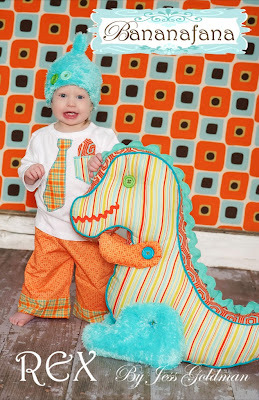 Are you sewing anything for your kids? 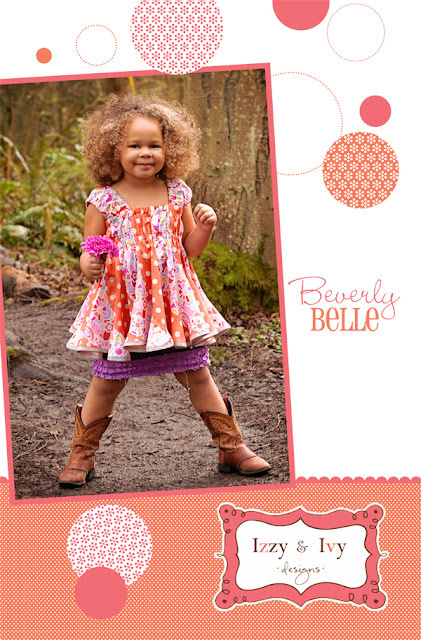 All of these fabulous photos are from Izzy & Ivy. There's more on their site! Do you every wonder what inspires a designer? Kim Diehl is known for her beautiful designs and her color choices are divine. We recently asked her about her inspiration when designing. HG: Can you give us some idea about how you start with designing a fabric collection? 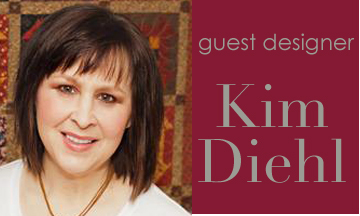 KD: I like designing collections that can easily be mingled together for more versatility. 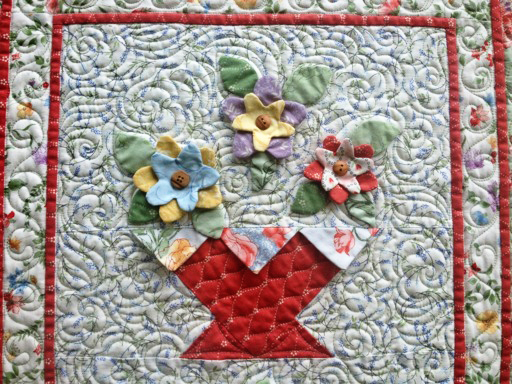 This is a block that I've been working on for a new teaching project, and it uses only fabrics from my different lines. HG: Where do you find inspiration? 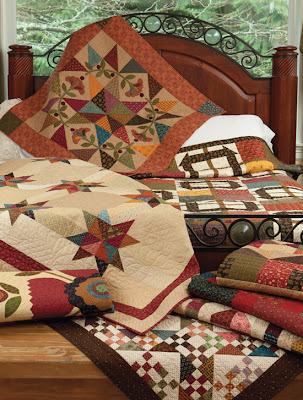 KD: I do lots of daydreaming for quilt and fabric designs on this front porch! Here's a view of my favorite country-style flower bed that borders my front porch. HG: We know that you are working on many new things. Are you able to tell us about any of them? 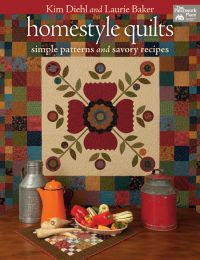 KD: I do have a new book coming out in mid-October called Homestyle Quilts that I co-authored with my technical editor, Laurie Baker. 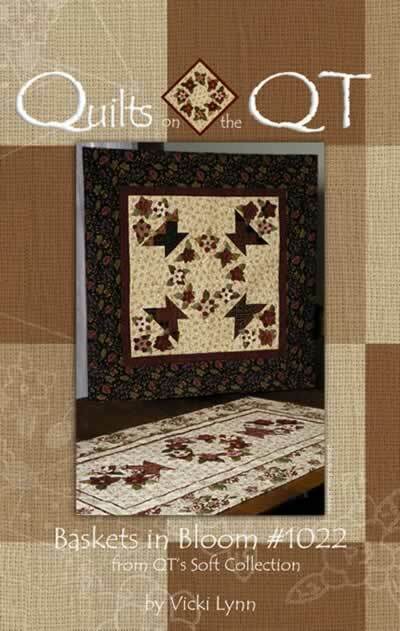 It's a book of simple quilts and quick recipes. See more images here. 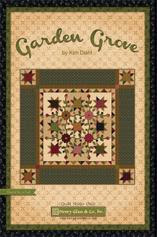 As for fabric, I've got one new line called Garden Grove that was pre-introduced at Spring Market and two more in the works. HG: We wanted to share a photo of your special friend, Murphy! So adorable! KD: This is Murphy, who is my little shadow when I'm at home. With his help, it only takes me twice as long to get everything done! HG: How do you share your love of quilting? KD: I have a "Good Clean Fun" page that includes quilting tips, recipes, and free patterns. Because of health issues I was having last year, I thought that I was "retired" from travel and teaching, but I'm now such a bundle of good health that I'm taking my act on the road again and have re-built a teaching schedule, just on a bit more limited basis. Remember that we still have the giveaways open for the Summer Party! Start here, read each post and answer the question at the bottom of the post to enter. Comments closed at midnight on August 10, 2012. Day 5: Beth Logan and Chelsea Anderson! 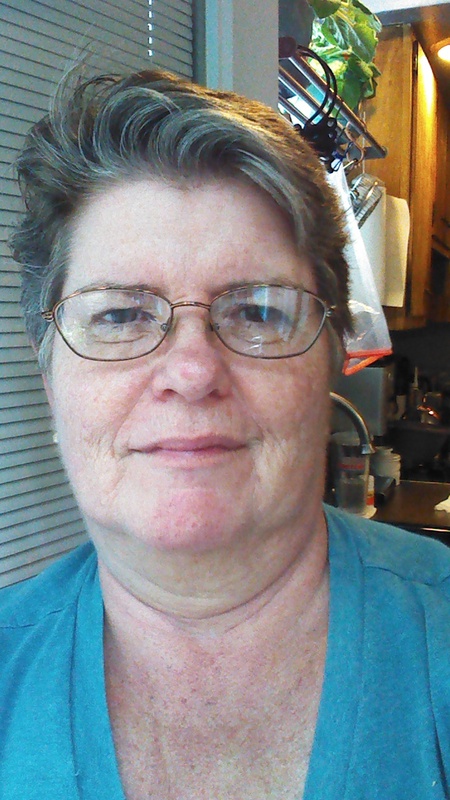 Day 4: Jana Nielson and Brenda Pinnick!